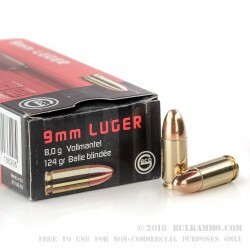 Looking for a high performing 9mm for your next range day? 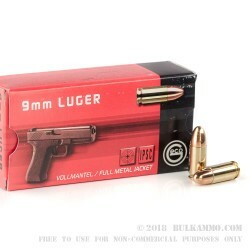 GECO 9mm Luger is loaded with a 124-grain full metal jacket projectile into boxer-primed, noncorrosive reloadable brass cases. Ideal for target practice and the high-volume shooter, these rounds are capable of a muzzle velocity of 1180 FPS, and offer consistent performance and accuracy. 50 rounds of 9mm 124-grain full metal jacket rounds come in each box. With over a century of experience in ammunition manufacturing, GECO is a name trusted by hunters and target shooters worldwide. Made in Germany and part of the Ruag group (RWS, Geco, DAG to name a few), GECO prides itself on producing high quality, premium target ammunition at a price that keeps you shooting.